This match was organised by our own Mike Ball and his troop to give a game to the Under 19s Ladies team who next year are visiting South Africa and to try to raise some coffers for them. Despite the attempts of this year's summer to drown our best intentions, the hard work of all managed to ensure that this match started only 30 minutes late, and ran its full course. And the young shall inherit the earth. Indigoite Blog Spot, quoting the Financial Times based on the Beatitudes. This was a first for me in many ways. It was the first time I had scored a Ladies match – come to that any County representative side, and the first time I had scored the Academy boys, and the first time that I had scored a team with a brother and sister in the same team. The Ladies won the toss and elected to field. Reece Stanbury and Alex Savage opened. It became a 'family matter' when our own Rose Ball opened the bowling at the road end. As usual Reece laid about the bowling in his own inimitable way until he missed a straight one and was given out LBW to one that the umpire said was stone cold dead. This brought Alex Hannam, captain of the Academy to the crease. We have not seen much of Alex Savage this year, but have received reports of his successful batting for his school. Today he showed his class as he quietly made his way to 50 off 74 (the highest score of the day) before retiring out in accordance with the rules of the day. Alex Hannam batted with more assurance than I have see for some time, before slapping a short delivery from Julie Walliker to mid off. The Ladies, on the day, appearing to be one Lady short, Julie's brother Jodi joined the Ladies team. On a familial touch it could at this stage be pointed out that Reece Stanbury was joined by his brother Carl, Alex Hannam by his brother Ollie, and they, and many others including Rose were watched by their critical, and no doubt at times, uncritical, parents. James Hayter (I wonder whether he in 35 years time – and Jack Ford come to that – sport the same hair styles as their fathers) came in at 4 and was unfortunate to catch a leading edge to be caught and bowled by Lydia Clements. Tom Brend again showed some of the class I have heard talked about to harvest 33 before being caught off Steph Hutchins. Ollie Hannam was his usual bustling (not to say noisy self) for 20 before being stumped off Steph Hutchins, whilst Jack Ford was not out 10 and Josh Roach not out 12 at the end. Karne Elphick was unfortunate to miss out. At the interval a proud James Ford said that he thought Jack batted just like he himself – I thought no, not another 20 years please!! Roe Ball finished with 1 – 33, Lucy Walliker 1 -28,Steph Hutchins 2 – 34, Lucy Walliker 1 – 17, Lydia Clements 1 – 21 and brother Jodi Walliker 1 – 17. Alex Hannam had asked 200 from hos team, the question was, was 196 enough. After a quick cup of tea, hostilities were resumed. Carl Stanbury and Karne Elphick opened the bowling while Steph Hutchins and Olivia Jones the batting. Olivia was unfortunate to miss a straight one from Karl and was adjudged LBW which brought wicket keeper Imogen Beaseley to the wicket. These two put on 47, the highest stand of the innings, and both made 25. Imogen Beaseley was stumped by Ollie Hannam off Bradley Smith (remember, he was stumped himself by Imogen) who finished with 1 – 26 off 7. He together with Jack Ford, and then Josh Roach put the brakes on the Ladies innings with very accurate spells. Steph Hutchins was caught by Alex Hannam off Jack he finished with 1 – 14 off 7 with 3 maidens, and Josh Roach 11 runs off 5 (rumours persist that he will be called into the Australian squad for his bowling following their defeat by England today!). After Jack, James Hayter came on and the sea end, and in a mixture of leg and off spin bowled Lydia Clements for 19, and captain Lauren Bowden for 1. He finished with 2 – 18 off 4. 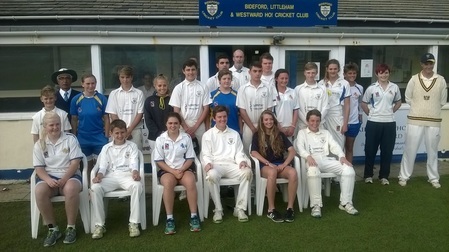 This brought the Walliker partnership of Lucy and Jodi together, Lucy hit 23 before being caught by Reece Stanbury off brother Carl, whilst Tom Brend collected Emily Dodds bowled and Eloise Maxa caught smartly by Alex Hannam off the last ball, leaving the Ladies on 127 – 9, 70 runs short. Despite not really being close, this was not only an enjoyable game of cricket, played hard in the right spirit, but a look into the future when the Young will inherit, well if not the earth, probably the cricket ground. For the Academy, we know of the abilities in regular Devon league of Alex Hannam and Alex Savage and Tom Brend. Many of the others have shown their talents in Sunday League whilst a few were 'on show' to me for the first time. However clearly here is the nucleus of next generations team – if they remain committed a big, big if in these days. As to the Ladies, apart fro Rose, I have bot had the pleasure of seeing them play before, but I have no doubt that there is equal talent there also for the future.